Hi! 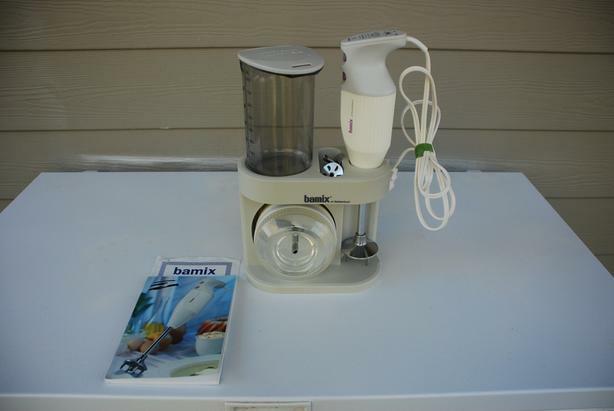 I have a Bamix of Switzerland immersion blender for sale. It is in perfect working order. It is a model M133 9-piece set plus the original 96-page user manual and extensive recipe book. It measures 8"L x 4"W x 14.5"H when all the parts are in the convenient display stand. There are lots of immersion blenders around now but Bamix was the first. It was invented in Switzerland by Roger Perrinjaquet who patented the idea on March 6 1950. He called the new appliance "bamix" which is a combination of the words "batere" (beats) and "mixe" (mixes) in French. Bamix immersion blenders have been manufactured and sold by the Swiss Bamix company from 1954 to this day. Also, just so you know, I have contacted two Canadian distributors of Bamix and they both confirm that this appliance has remained basically unchanged for years so all replacement parts are still readily available and the internal electronics can be sent to a Canadian location for repair, if need be. In addition, this blender will fit into any new design of plastic storage container if you want to make change. So, despite the age of my Bamix (about early 2000s, I think), it has been used only about ten times in total and all the replacement parts are still available. I have all the parts purchased originally as follows: the immersion blender (made up of the body and the stick), the plastic display stand (which Bamix calls a cassette), a 30 fluid ounce polycarbonate jug with lid, a wet/dry mill with lid, three interchangeable blades (processor/mincer, aerator/mixer, and blender), and the manual/recipe book. The list price of a new Bamix immersion blender today is $369.99. I am asking $200. I am located in Vancouver, BC but shipping is no problem. I will be happy to mail this Bamix to you using CanadaPost and Interac bank transfer. So, if you are interested in purchasing, e-mail me and we'll figure out the logistics and/or I can answer any questions you may have. Thanks!